Will ex-CIA Director Brennan become President Trump’s Allen Dulles? Were it not for the Internet, it’s almost certain that Donald Trump would have been JFKed by now. When virtually the entire U.S. Intelligence Community is aiming for you, there’s no way to escape their furtive plots and deadly machinations. In November of 1963, former CIA Director Allen B. Dulles deceptively floated the key details of an assassination plot against President John F. Kennedy. The assassination plan was purported to take place during Kennedy’s visit to Chicago in early November, which he subsequently cancelled. The details can be found in the following link. The deliberate uncovering by the C.I.A. of this conspiracy to kill the POTUS was nothing but a ruse meant to give JFK et al. a false sense of security during his visit to Dallas later on that November, which it did. While the C.I.A. did not order the hit, they were put in charge of the execution plan for several reasons. Not only did The Company (as the CIA is known in intelligence circles) have an ax to grind with Kennedy after the failed Bay of Pigs invasion of Cuba, Dulles and his core team were unceremoniously fired shortly thereafter for insubordination. Allen Dulles seen with purple bow tie stands to the right of President Johnson. Wait, they’re ALL wearing purple ties. Is this where today’s purple revolutionaries got the color from to signify a coup in the White House? Quite disrespectfully, President Lyndon Johnson appointed Dulles to the utterly corrupt Warren Commission where he became the report’s final arbiter after acting as a lead investigator. Johnson knew that he could count on Dulles to promote the absurd “lone assassin” theory given that the ex-CIA administrator oversaw the assassination scheme as well as the complex cover-up. Now fast forward to 2017. This time around another C.I.A. Director — John Brennan — ignominiously resigned effective Donald Trump’s Inauguration Day. One could say that he was ushered out of C.I.A. headquarters in Langley, Virginia because of his unprecedented open hostility toward Candidate and then President-elect Trump. As a matter of historical fact, no C.I.A. Director has ever publicly expressed such antipathy toward a presidential candidate or sitting POTUS. It’s just never happened before. 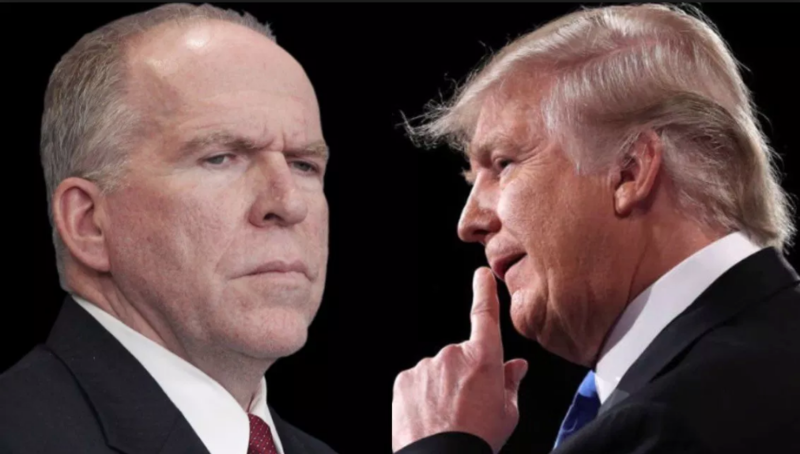 Clearly, Brennan’s highly contemptuous behavior is not only a reflection of his personal animosity toward President Trump, it also indicates that he’s one of several lead agents of Deep State’s slow-motion coup. It’s now self-evident that the entire U.S. Intelligence Community has been running a soft coup against the Trump administration that literally began on Election Day. In point of fact, the public record is replete with shocking instances of former senior intel officials attacking Trump in a manner never witnessed in American politics. Even John F. Kennedy never suffered the unrelenting assaults that Trump has weathered since he declared his candidacy in June of 2015. All along, it has been John Brennan who has led these acrimonious attacks. President Trump must watch his back, especially where it concerns his secret services and intelligence agencies. This how they always take out the high-stakes political targets; the real perpetrators compromise those closest to the targeted individual. The FBI has already proven to be filled with Trump haters as is the DOJ and Department of State. Even AG Jeff Sessions has acted in a manner that is unprecedented, particularly in the face of so much naked criminality and corruption at Justice. His complete and total failure to drain the swamp, the very reason why his boss was elected POTUS, is quite alarming. Then there is the Neocon cabal that inhabits every corner of the West Wing. These dual citizen Zionists have more loyalty to Israel than they do to the United States. What might they do if Trump starts to abandon their mission to invade and conquer Iran? However, it is the likes of John Brennan, James Clapper, Michael Hayden, Michael Morrell and other covert intel operatives who are the most dangerous. For they continue to control factions within the U.S. Intelligence Community which could prove to be life-threatening to the POTUS at any moment. John Brennan’s recent comments about Trump ought to give every American reason to pause…and then offer a prayer of protection. In November of 1963, the C.I.A. 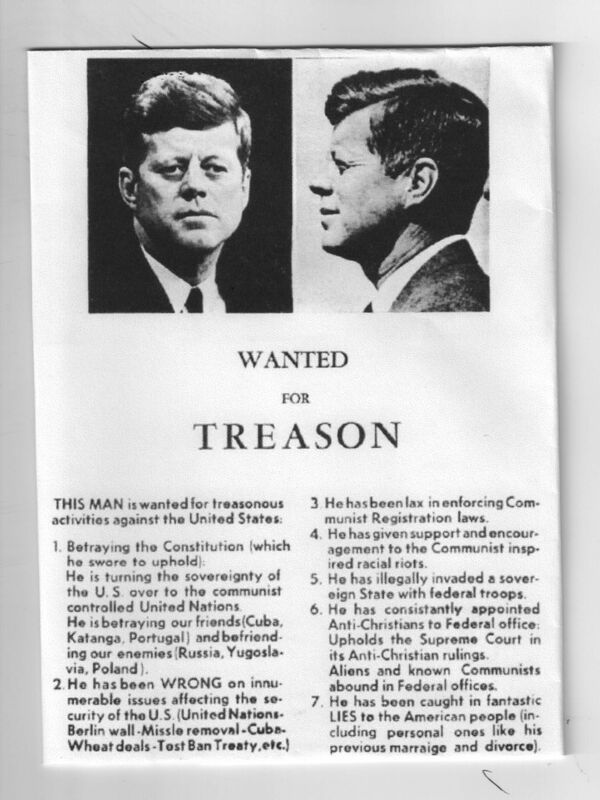 circulated a flyer all over Dallas, Texas in advance of the assassination of President John F. Kennedy. It’s quite likely that fired CIA Director Allen Dulles was directly responsible for that smear campaign. He was very experienced in the toppling of governments around the world, which his tenure at the CIA was well-known known for. More details about this treasonous scheme can be found at the link below. Deep State is setting up Trump just like they did to President Kennedy … but it’s the Shadow Government that’s really calling the shots. 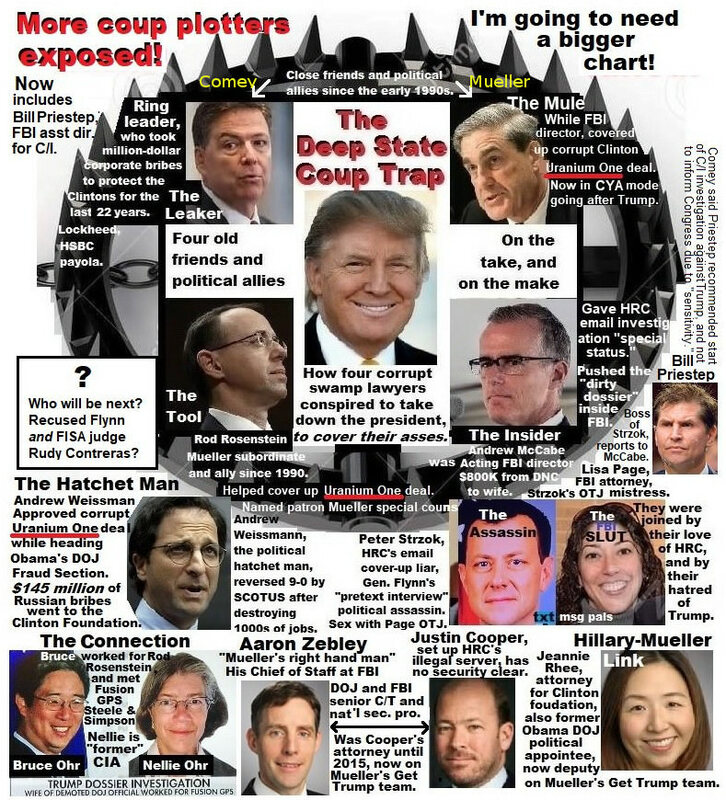 What follows is a copy of that seditious bulletin that was tactically used to bone up the traitors citywide who were about to participate in a massive conspiracy to execute the POTUS and then cover it up. Fast forward again to July of 2018 and we see another former CIA Director publicly defaming a sitting POTUS with groundless accusations of “treason” and “high crimes”. The critical point here is that Deep State is notorious for using the very same strategies and MO to remove political leaders when they are desperate. And there’s no question the NWO globalists are desperate like never before.